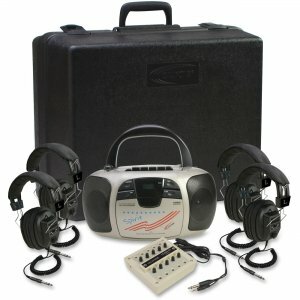 Four-person listening center supports lessons and reading practices no matter where literacy skills are being taught. Multimedia stereo features a built-in microphone to record student responses and help monitor their progress. Foam-lined storage case with extra room for recorded materials is perfect for itinerant teachers and AV carts. The 10-position stereo jackbox features individual volume controls to compensate for the differences in people's hearing sensitivity. Stereo headphones with noise-reducing earcups lower ambient noise so the volume does not need to be played at high levels. Listening center is perfect for individual or group activities, literacy groups, ELD, ESL and other language learning programs.